Finnish yard Baltic Yachts has announced the launch of Bill and Me — its first new-build motor yacht for more than a decade. 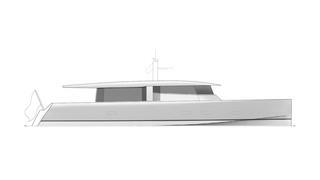 The sailing yacht specialist did build a handful of 14.8 metre motor yachts in the late 1990s, but this new 23.9 metre launch could mark the start of a new era for the yard, which recently released designs for a new series of 24 - 41 metre motor yachts. Exterior styling is by Germán Frers, with clean lines and a plumb bow, while the interior comes courtesy of British studio Design Unlimited, which was given the brief of creating a contemporary feel. The main superstructure contains two separate saloons, one for lounging and another for dining — a feature normally reserved for much larger craft. Both areas provide easy access to the exterior relaxation spaces. All of the accommodation is situated below decks and the layout comprises an owner’s suite up in the bow, two guest cabins amidships and two crew cabins fitted back aft. 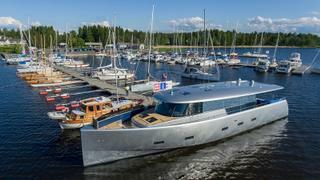 The engine set-up and cruising range have not been disclosed, but Baltic added that Bill and Me rides on a composite semi-planing hull, which is designed to cruise comfortably at speeds of up to 25 knots. Upcoming sailing yacht projects at the Finnish yard include the 25.91 metre Baltic 85 Custom and the 34.14 metre Baltic 112 Custom, both of which are due to hit the water next year. The 42.28 metre Baltic 142 Custom — a planned 2019 launch — completes the yard's order book.